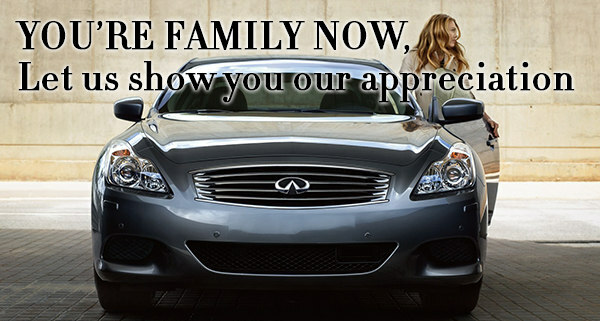 Guelph Infiniti is pleased to announce an enhanced Refer-A-Friend program to reward loyal clients and friends for endorsing our dealership. The program is simple. Just let a Guelph Infiniti employee know the prospective buyer’s contact information or log it on our website’s Refer A Friend form on the left, and once a purchase if finalized we’ll pay you with a cheque for $100! We’ve added a bonus program so that every fifth referral is worth an extra $100 ( Every fifth referral is a $200 Reward). If you have a sales consultant you want the referral to be handled by, please let us know with the website form on the left.